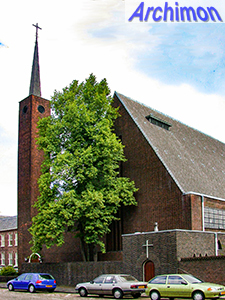 Jan Joseph Wielders was born in Sittard on September the 3rd of 1893 as the son of a carpenter. Shortly after his birth the family moved to Nieuwstadt. 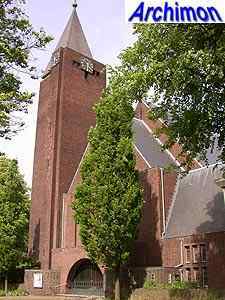 At the age of 13, Joseph attended the drawingschool in Roermond and in 1902 was hired as a draughtsman by architect Joosten in Valkenburg. 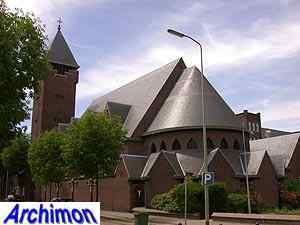 In 1910 he became overseer for the town of Sittard and was later appointed town architect. In 1917 he left the municipal service to start his own firm in Sittard. Like A. Boosten, Wielders was a modernist who would have nothing to do with any of the neo-styles. Instead, he was influenced by the ideas of H.P. 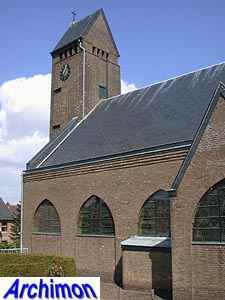 Berlage, like clarity of construction, and the expressionism of the Amsterdam School, both in his profane and religious work, with as a highlight the watertower in Schimmert. He used reinforced concrete for the skeleton of his churches, mostly in the form of pointed arches which allowed for wide aisles, and used brick for the walls. By 1935 Wielders' style had become more conservative and featured traditional elements from his native province of Limburg. His importance as an architect of churches had diminished by then. After World War Two he built two more churches, one of which replacing one he had built before the war. He was assisted by J. van Groenendael, who contnued the office after Wielders' death on April 30th 1949. The following is an incomplete list of Wielders' work, concentrating on his religious work and important profane designs. Building in so-called Um 1800 style. Wielders' first church. One-aisled building in moderate Expressionist style. 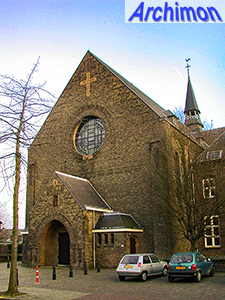 Choir extended in 1954 by architect H.J. Palmen. 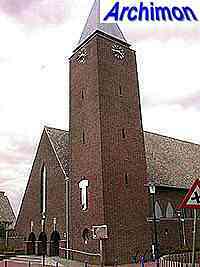 Cruciform church in moderate Expressionist style, with tower. 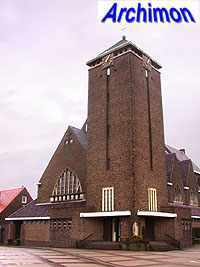 One-aisled cruciform church with stepped, rectangular choir and a tower with a saddle-roof. Complex in moderate Expressionist style. Church in Expressionist style. Destroyed in 1944 and after the war replaced by a new church by Wielders. Chapel in simple Expressionist style for a school. 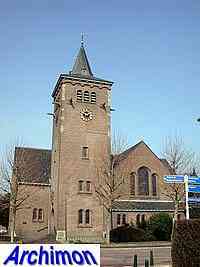 One-aisled church with tower. The nave is flanked om both sides by series of chapels. 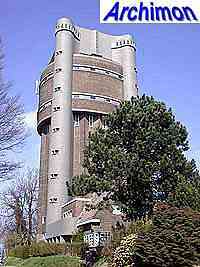 Water tower in rich Expressionist style. Tower added to older church. 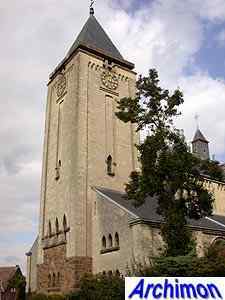 Like the church, the tower is built of marl. 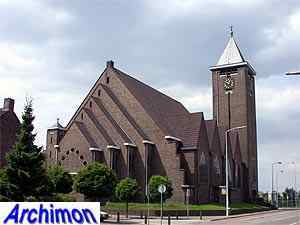 Three-aisled church in Expressionist style. Semi-circular choir with ambulatory. School in moderate Expressionist style. 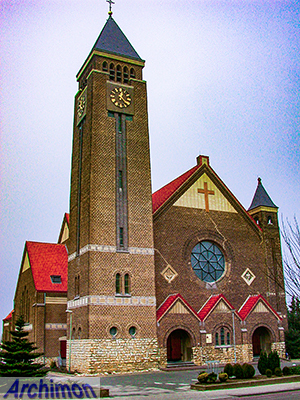 Three-aisled cruciform church in moderate Expressionist style. Tower inspired by the work of W.M. Dudok. 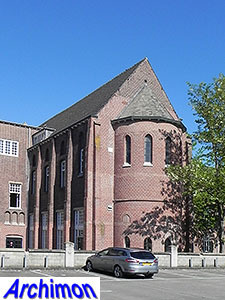 One-aisled chapel in moderate Expressionist style. Slim tower next to the front. Convent in Traditionalist style, with chapel. Church in Traditionalist style, based on the foundations of the destroyed predecessor. Completed by J. van Groenendael after Wielders' death. Cruciform church in Traditionalist style. Completed by J. van Groenendael after Wielders' death.